While in Madagascar, Dr. Hayek operated 12 to 14 hours a day for four days, providing surgery for congenital ptosis (droopy lid), entropion (eyelid malformations), tumors, and burn trauma, primarily. Oculoplastic and reconstructive surgeon Brent Hayek spent 12 days last fall in a medical outreach to Madagascar in its capital city of Antananarivo ("Tana"). Aided by the efforts of Susan Lewallen and Paul Courtright, our Global Vision Initiative co-directors who direct the Kilimanjaro Community Centre for Ophthalmology in Tanzania, the visit was to provide needed oculoplastic clinical expertise, surgeries and training in this underserved area. The existing 30 clinics in Madagascar feed into the SALFA (Sampan' Asa Loterana momban'ny FAhasalaman) Hospital, and provide needed surgery or other treatments for patients. Hayek operated 12 to 14 hours a day for four days, providing surgery for congenital ptosis (droopy lid), entropion (eyelid malformations), tumors, and burn trauma, primarily. He happily reported that other physicians in the region participated in the week-long service and training. "This was an amazing experience in all aspects," says Hayek. "I went primarily to train local ophthalmologists in basic lid and other oculoplastic procedures through hands-on guidance, lectures and provision of materials. The primary goal was to provide enough training so that local ophthalmologists could care for their own people. It was a good turnout with a number of private hospital, public hospital and private practice surgeons who came to this endeavor. The warm reception and appreciation of the local doctors and patients was great. "At the end, we also saw some lemurs, ate raw zebu and toured the surrounding region," says Hayek. "I hope this can become a site where other Emory and local physicians can establish future training in pediatrics, glaucoma and retina. All aspects of ophthalmology are needed." 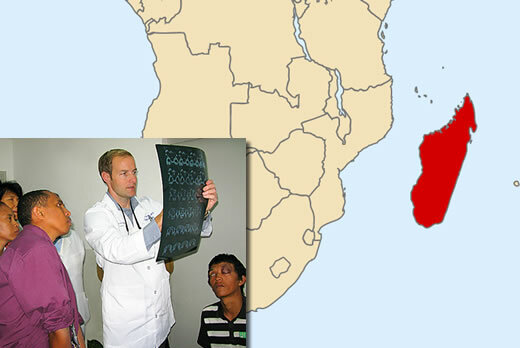 In the future, Hayek will return to Madagascar, possibly with other Emory Eye Center specialists. "Ideally we would like to create a longstanding relationship between Emory ophthalmology and Malagasy ophthalmologists," says Hayek. "There is enough capacity in the country to allow further training in subspecialty care. An Eye Center team, including myself, and Drs. Lenhart and Giangiacomo, is planning strategies to return to Madagascar for phase two of this effort."